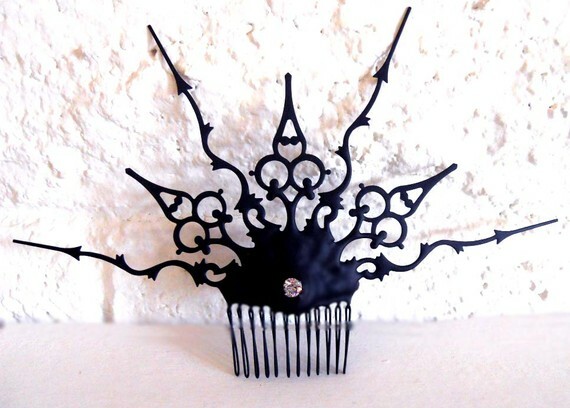 10-13-11... Etsy Bride Blog is a this lovely source of eye candy that I was thrilled to have my Steampunk Hair Comb featured on. She did a to die for post with tons of items for a Steampunk wedding. I literally wanted to run out and buy every piece. 8-29-2011... 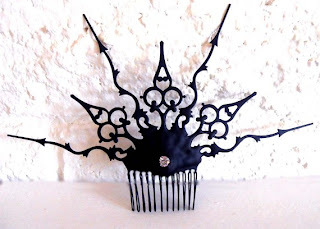 Dark Euphoria Blog was kind enough to feature one of my favorite hair combs that I make "In the London Fog". She happens to be a former customer of mine which makes me doubly excited. A few years ago she purchased one of my tiaras, and had lovely things to say about it in the article. 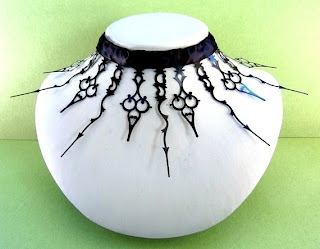 7-14-2011... My-P-Project Blog featured my sweet little crow painting called A Crows Obsession Nevermore. Ok so the blog is in Hungarian. Given that I am just assuming she liked it. She did put a little heart emoticon <3 after the posting. Who knew that emoticons could be so useful. She has such a great blog I'm honored to be posted there, and doubly honored to have my work translated into a different language. 3-18-2011... Goofing Off Blog Featured my Queen of Hearts Royal Whim tiara in Miss Eileen’s Top Etsy Finds of the day. It's an amazing feature on a very fun blog. Also there is a twist to it. The picks of the day are voted for, and the winner gets interviewed at a later date on the blog. How fun! I can't wait to see who the winner is. 2-28-2011... Outblush Blog Featured my Queen of Hearts Royal Whim tiara in one of their fashion picks of the week. 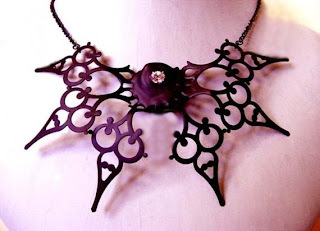 The caption says it all... "Gothic Tiara: Holy steampunk prom princess, Batman! How many cool points will you get for snagging this for your slightly eccentric niece?!" It just tickled me so much when I read that. 1-01-2011... I was honored to be picked for Etsy's Darkside Janurary Team Exhibition. The theme was "Restless Spirits in the Attic." The item that was chosen was my Clock hand choker Edwardian Tea Party . 12-18-2010... I'm so excited!!!! My Pretty Zombie Shop on Etsy created an eyeshadow color and named it after me after me. Ok well technically it's named after my shop name, but seriously I pour so much of my soul into what I make, and that is pretty much how people know me on the internet so yes indeed it is named after me . It's called EJPcreations Darksider Eyeshadow and it's the most beautiful intense bright sparkly red you can imagine. I just love it and she did an amazing job. 02-25-09 – Foundhandmade Blog posted about the There is Time Enough choker in the kindest article on foundhandmade.com . 02-22-09 – Outsapop, hailing from Helsinki Finland, was kind enough to feature two of my items on her blog outsapop.com. Listing among her favorites were my There is Time Enough Choker, and my Walking After Midnight hair stick. 02-20-09 - I couldn't believe it CRAFTzine Blog actually posted about my choker There is time Enough on their website craftzine.com. One of the reasons I started making jewlery again was becasue I happened to pick up one of their magazines and completley fell in love. The articles were amazing and so was the photography. It taught me to have fun again with making things. Instead of the bootcamp mentality of the school I had just graduated from. They were one of my biggest influences, and to be so honored by them was overwhelming. Especially, since I just opened my shop a few months before. I couldn't be more pleased. 10-01-08... I'm in a real life print magazing about art!!! 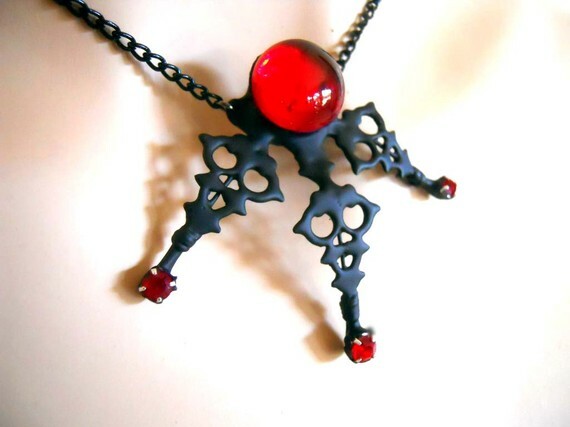 Ok so it's not me it's a necklace I made. And... well the article isn't about the necklace, but of the sculptress Laurie Hassold. BUT she's wearing the necklace that I made for her in all the pictures so that HAS to count for something. It's a beautiful article about her work by Daniella Walsh for Art LTD artltdmag.com . And the necklace was made especially for Laurie out of silver to resonate with her work so she could wear it to her openings, and for photo oppretunities. In my March 29, 2010 post I explain a little more about it. 09-17-08... EJPcreations opens her doors for business!!! I listed my first item on Etsy. That day will rest in my heart forever as the best leap of faith I have ever made. Here are some of my thoughts on starting my shop as I approached my first year anniversary selling on Etsy in this post from August 12, 2009.